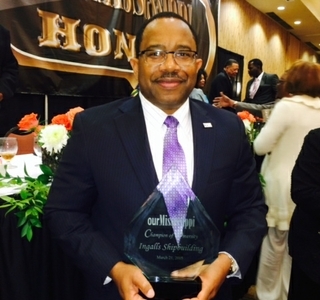 PASCAGOULA, Miss., March 24, 2015 (GLOBE NEWSWIRE) -- Huntington Ingalls Industries' (NYSE:HII) Ingalls Shipbuilding division was recognized at the second annual Our Mississippi Honors Gala for its diversity and inclusion practices. The gala, sponsored by Our Mississippi magazine, took place on March 21 at the BancorpSouth Conference Center in Tupelo. The gala is an annual statewide celebration of corporate diversity hosted by the Tupelo Convention and Visitors Bureau. Ten corporations including Ingalls were honored. The event recognizes companies and individuals who have distinguished themselves by promoting diversity and inclusion in Mississippi. 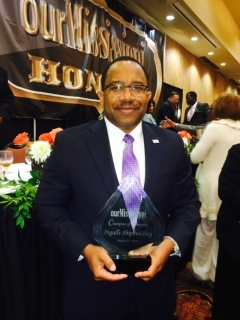 "We are honored to receive this award from Our Mississippi magazine," said Edmond Hughes, Ingalls' vice president of human resources and administration. "At Ingalls, we strive to promote diversity and inclusion in every aspect of our business because we are committed to our employees and our community. We make character, civility and community a priority, and we take measures to strengthen diversity and inclusion in all areas of our company so we can provide a great place to work for our employees." Ingalls has an executive leadership diversity and inclusion council and a diversity and inclusion advisory committee. The company also encourages employees to join one or more of its five affinity groups available to all employees. Additionally, Ingalls attends national diversity conferences and coordinates several diversity heritage programs throughout the year. It also sponsors diversity awareness campaigns and offers training to employees. From 2008 to 2014, Ingalls has had 91 employees nominated for awards from national diversity conferences, including Black Engineer of the Year, Society of Women Engineers and Society of Hispanic Professional Engineers. Additionally, 69 employees have won awards and five have received tier-one national awards from these conferences.